The County Executives provided voters with several tools and resources including how to find their polling location. Long Island, NY - November 1, 2018 - Suffolk County Executive Steve Bellone and Nassau County Executive Laura Curran today offered important information to Long Island residents that are planning to vote in the General Election on Tuesday, November 6. The County Executives provided voters with several tools and resources including how to find their polling location, hotline numbers for reporting a problem or complaint, and transportation options to get to your polling site. “It is our responsibility to provide all registered voters the ability to cast their vote. Make sure you are registered, locate your polling place, and exercise your right to vote,” said Nassau County Executive Laura Curran. To check your registration or find your polling place visit www.suffolkvotes.com or www.nassaucountyny.gov. Voters who requested an absentee ballot must have their ballot postmarked by November 5, 2018. 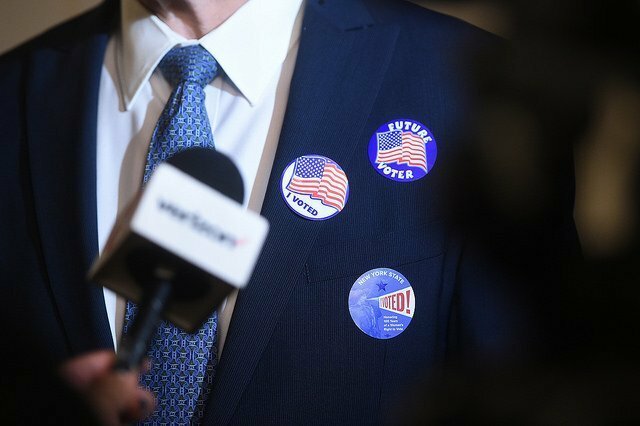 Polls will open in Suffolk and Nassau Counties at 6 a.m. and close at 9 p.m. and voting instructions and a sample ballot will be posted at all voting places. To view a sample ballot before heading to the polls visit www.ballotready.org. In order to register to vote, you must be a U.S. Citizen, 18 years or older, live at your present address at least 30 days before an election, not be in jail or on parole for a felony conviction and not claim the right to vote elsewhere. You can register in person at Suffolk County Board of Elections, Nassau County Board of Elections, or at any New York State Agency-Based voter registration center. You can also call the Suffolk County Board of Elections office at 631-852-4554 to request a voter application. The voter registration deadline to be eligible to vote in the November 6th General Election was October 12, 2018. Voters who experience problems on Election Day can call a national hotline that is staffed with legal experts to answer questions at 866-OUR-VOTE or can send tweets regarding problems to @866ourvote. Voters experiencing problems can also call the New York State Attorney General’s office at 800-771-7755 or email civil.rights@ag.ny.gov to troubleshoot and resolve issues encountered at the polls. The United States Attorney’s Offices for the Southern and Eastern Districts of New York have also launched a hotline to receive complaints. Nassau and Suffolk County residents can call 718-254-6790. Spanish speaking voters can call a national bilingual hotline run by NALEO Educational Fund at 1-888-839-8682 to report issues. According to the Center for Information and Research on Civic Learning, transportation is a significant barrier preventing registered voters from partaking in the democratic process of voting. To help combat this issue, Uber will be partnering with #VoteTogether and Democracy Works to provide free and discounted rides to the polls on Election Day. In order to take advantage voters must use the Uber app and enter the Election Day promo code which will be made available on Election Day. Lyft will also be providing a 50% discount code for rides to the polls and will be working with Vote.org, Nonprofit Vote, TurboVote and more to help distribute codes to those who need them. Federal and State laws put protections in place to protect voting rights and prohibit discrimination based on race, national origin and disability status. There are also laws requiring bilingual assistance. The Help America Vote Act (HAVA) ensures voters are not excluded from the voting process due to an administrative error or uncertain eligibility. If a voter arrives at the polls and their eligibility can not be proven, they may request a provisional ballot. Once it is determine that the voter who cast the provisional ballot was eligible to vote, the ballot will be counted as a regular ballot. Additionally polling places are required to be ADA complaint. Suffolk and Nassau County voters with disabilities have the option of casting their ballots on ADA complaint voting machines. Subject: LongIsland.com - Your Name sent you Article details of "County Executives Bellone and Curran Remind Long Islanders of Voting Rights and Guidelines Ahead of Upcoming Election"